Egypt: Developments of Operation Sinai 2018 - Egyptian Institute for Studies. – The Air Forces destroyed five vehicles and warehouses in North Sinai. – Three militants were killed within the course of the ongoing operations in North and Central Sinai, and a number of machine guns and ammunition were found in their possession. – Fifty-nine suspects were arrested during the operation in North and Central Sinai. – Twelve vehicles used to attack security forces were destroyed. – A fuel storage place, a warehouse and a workshop were destroyed. – At least 285 hiding places and storehouses were destroyed and 200 kilograms of TNT were seized in North and Central Sinai. – The Armed Forces detonated 10 explosive devices and destroyed a number of tunnels in Rafah. – Borders guards seized 120 cartouche guns, three sniper guns, a machine gun, 7,340 bullets, 1,928 kilograms of hashish, three million narcotic pills and eight four-wheel drive vehicles. – The troops also seized a smuggling truck carrying three persons who were hiding seven Thuraya satellite phones and 320 heroin packs weighing half a ton. Also, smuggled foreign currencies were found with them. – Eleven vehicles and two motorbikes along with 279 kilograms of bango and 9,700 narcotic pills were seized. – A soldier was injured and two civilians martyred during the operation. – IS-affiliated ‘Sinai Province’ launched at least one attack against the army forces and pro-army local militias in the Rafah area and set up more than 4 ambushes. – Sinai Province engaged in more than 15 armed clashes against the army forces in the areas of South Sheikh Zwaid, and South and West Rafah. – Sinai Province snipers hit 11 targets, and militants detonated more than 30 anti-tank and anti-personnel explosive devices. – Sinai Province destroyed and damaged 33 military vehicles. – Sinai Province seized one four-wheel vehicle in addition to military equipment from the army forces and pro-army local militias. – At least 13 military personnel were killed, including 5 officers. – At least 2 pro-army local militants were killed, and one executed. – Some 9 soldiers were injured, including at least 1 officer. 1- On July 2, Egyptian Prime Minister, Ashraf Madbouly, issued a decision (No. 1194 of 2018) to renew imposition of a curfew on parts of North Sinai starting 14 July, the curfew will include the area from Tal Rafah in the eastern part of the peninsula to the international border, and from Halal Mountain to Al Awja. The curfew will be in effect from 7pm until 6am (local time), except in El Arish city and on the international road, it will last from 1am to 5am. In fact, this decision was not surprising; and Imposition of curfew in parts of North and Central Sinai is expected to continue for the next two years. This decision was not only made for the purpose of limiting armed activities, as curfews are not effective in some types of armed rebellion, particularly in assassinations, detonation of improvised explosive devices, and kidnappings; for such operations are mainly carried out during the time of curfew. However, the curfew decreases the effectiveness of major attacks and restricts the freedom of movement of civilians, which gives the security forces absolute powers to kill and arbitrarily arrest suspects. It is remarkable that all cases of liquidating detainees by National Security Service agents in Al-Arish city took place during the hours of curfew in the absence of civilian witnesses. 2- The number of military communiques has decreased, with only one communique issued in July to show the outcome of operations in part of June and July. 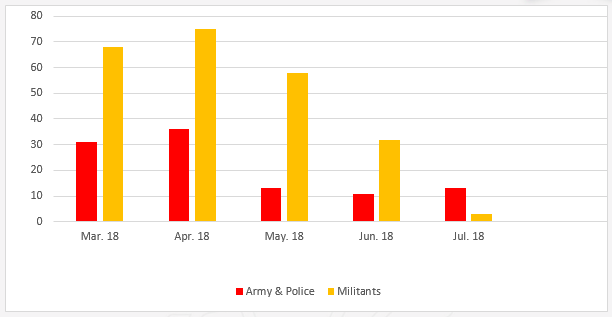 Also, the officially announced number of those who were killed among insurgents was relatively low, amid expectations that the number will increase in the Army’s August Communique after the National Security Service’s liquidation of 11 citizens on 11 July and 13 others on 25 July. 3- It is remarkable that the Army’s 25th. Communique, issued in July, as well as other military communiques, do not include any casualties or losses. Although at least 13 soldiers were killed, including five officers, the sole military communique of July admitted only the injury of one conscript and the death of a number of civilians (who were actually killed in June), and no more communiques were issued in July to include the real casualties. 4- Despite the resistance that is still shown by militants of the IS-affiliated Sinai Province, especially in the areas west of Rafah which had been displaced before, however the militant organization suffers from a high rate of attrition among its leaders. This led to emergence of a more stringent stream that has become influential among the organization’s ranks amid a stifling siege on its resources, restricting its effectiveness, but not eliminating it completely. It is impossible under the strategy of the current Egyptian regime to declare any victory in the Sinai Peninsula. Any military containment of the armed insurgency in Sinai cannot be considered a victory; it is merely a kind of cooling the situation for only a period of time. 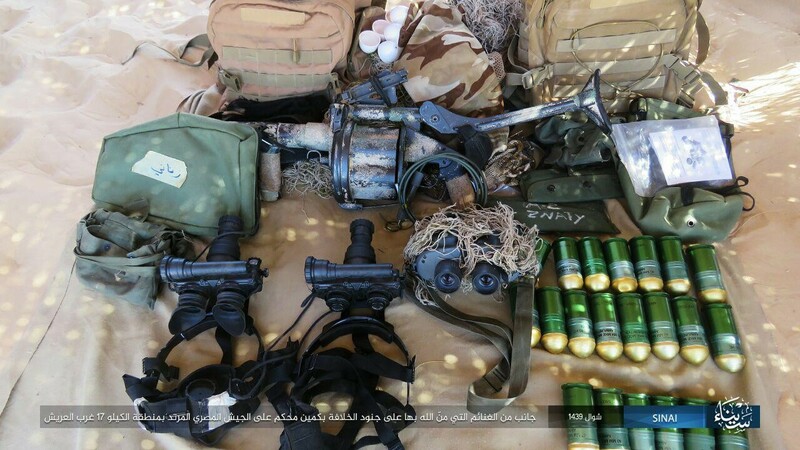 5- After absence for a period of time, snipers of the Sinai Province have reappeared strongly in the militant organization’s operations. 6- This month the Egyptian regime began demolition of new areas in ​​southern Rafah, including ​​Abu Al-Hilu, which never witnessed any activity of militants, with continuation of demolition of houses in the areas that had been evicted before. 7- Some observers link between displacement and creation of buffer zones and activities of the armed insurgents in the Sinai Peninsula, but in fact a large part of what is being done in Sinai is aimed at achieving political ends to the Egyptian regime in favor of other regional parties. For example, part of the areas that are now demolished and evacuated in the south of Rafah never witnessed any armed activity. However, they are evacuated and destroyed within the framework of drying up activities of trading through tunnel between the Gaza Strip and Egypt, to tighten blockade and practice a political pressure on the Gaza Strip government. 8- The army forces continue to isolate areas south of Sheikh Zuwaid, separating them from the rest of the city, especially the areas of Al-Shalaq, Al-Gharaa, Abu Al-Aaraj, and Al-Tuma” in order to clamp down on some Sinai Province elements in those areas. 9- The intensive activity of Israeli drones continued targeting members of Sinai Province, resulting in killing one of the militant organization’s leaders in Sheikh Zuwaid, Abu Jaafar al-Maqdisi (whose real name is Mohammed Abdullatif Abu Jazar according to some media reports). 10- July witnessed several clashes between the fighters of Sinai Province and the fighters of the local militias of businessman Ibrahim Al-Arjani and Mousa Al-dalh, resulting in deaths in both parties and mutual acquisition of equipment and weapons. During one of these clashes, intervention of an Israeli drone was detected with no reports about casualties. It is to be mentioned that such clashes are economic-oriented conflicts related to activities of smuggling between occupied Palestinian territories and Egyptian territories. 11- As a result of the failure to adopt long-standing and long-term positions against the policy of physical liquidation of citizens in the governorate of North Sinai, the National Security Service of the Egyptian Ministry of Interior maintained its policy of physically liquidating detainees suspected of belonging to Sinai Province organization. This was clearly manifested in the liquidation of 11 detainees on 11 July, and the liquidation of 13 detainees on 25 July. 12- Continuation of the policy of systematically killing, detaining, and forcibly disappearing minors in Sinai: On July 26, a security force belonging to the Egyptian Ministry of Interior arrested Ibrahim Ibrahim Shahin, 10 years old, from home in Al-Arish, as well as his father and mother. Also, Mahmoud Ibrahim Shahin, a minor, was arrested along with his uncle and his uncle’s wife. Also on July 4, Abdullah Abu Madin Nasreddin (12 years) appeared after 6 months of enforced disappearance since he was arrested from home in Al-Arish by security forces at the end of December 2017. 13- Authorities maintained adoption of security-oriented policies in dealing with citizens of North Sinai in light of the transfer of former notorious police officers to operation in Sinai. During the era of deposed President Hosni Mubarak, these officers were authorized to control the jihadi organizations in Sinai. Although they temporarily succeeded in the elimination of some cadres of armed organizations, yet they contributed indirectly to the growing hostility among tribes and citizens against the security services, which allowed recruiting new militants as a result of the repressive practices. 14- The comprehensive siege that was imposed on the people of North Sinai governorate at the beginning of Operation Sinai 2018, has been partially eased. For example, authorities allowed a limited provision of fuel for taxis and private cars on specific dates and with limited quantities, and also allowed the exit and entry of cars to the governorate on Thursdays, Fridays, and Saturdays. Also, classes were resumed at Al-Arish University after almost five months of suspension.